What is a non-shedding, hypoallergenic puppy? Why should you consider getting one? Anyone wanting a non-shedding doodle should buy a F1b doodle. Here’s a basic explanation of the F-factor. If you breed a pure Golden Retriever with a Standard Poodle, it results in a F1 Goldendoodle (50% poodle - 50% Golden Retriever). If you take that F1 Goldendoodle and breed that back to a Standard Poodle, you get the F1b Goldendoodle (75% poodle - 25% Golden Retriever). The result of an F1b doodle is a very high probability of a non-shedding coat since the poodle coat is dominant. 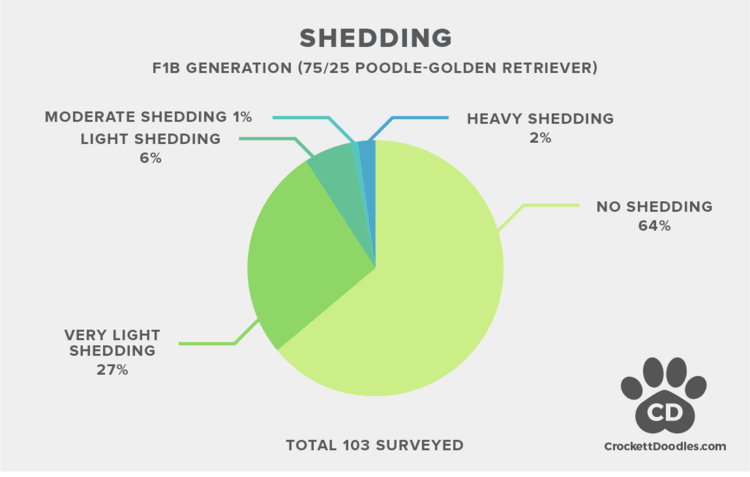 As you can see from the charts above, the F1b Goldendoodles (25%-75%) were much less likely to shed or cause allergies than the F1 Goldendoodles (50%-50%). Which puppy breed will better fit your family?